The Nice Sevens attracted squads from seven World Series nations, plus the hosts and guest team from the next round – Japan. Although the squads – or at least those that have been published (below) – were not quite full strength, most of the players had World Series experience and were current members of national squads. “The Sydney leg of the World Series at the beginning of February was the last time that this group played competitive rugby so the opportunity to compete in this invitational tournament will be invaluable as we prepare for Japan next month. The last five weeks have provided the squad with some proper recovery time after two back-to-back tournaments, as well as giving us the chance to put some consistent training in. The tournament was played as a single pool. France, Canada and Russia ended the first day unbeaten, though Russia dropped a point in a draw against England. England and Australia both ended the first day with a win, a draw and two losses, with England beating Australia in their final game of the day. Ireland had one win – also over the unpredictable Australians – while Spain’s only success was a draw, again against Australia. Japan lost all of their games. Day two opened with some surprise results, Spain beating England. 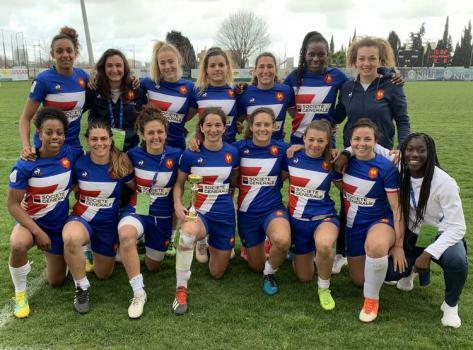 France comfortably beat Australia, while Canada and Russia drew – results that gave France a clear lead at the top of the rankings. In the second round of the day Japan achieved their only success when they drew with England, but at the top France lost their tournament lead after losing to Canada, while Russia drew level with them after beating Australia. The final round saw France beat Russia and move top, but Canada only needed to beat Australia in the final game to take title – but they unexpectedly lost, giving France the tournament by a single point. Russia were narrowly third. England and Ireland will have been pleased with fourth, ahead of Australia.